I often speak about PCORI’s commitment to involving people from across the healthcare community in our work as a way to make the studies we fund more useful and relevant to patients and those who care for them. That commitment was fully apparent at our third Annual Meeting, which ended just over a week ago. 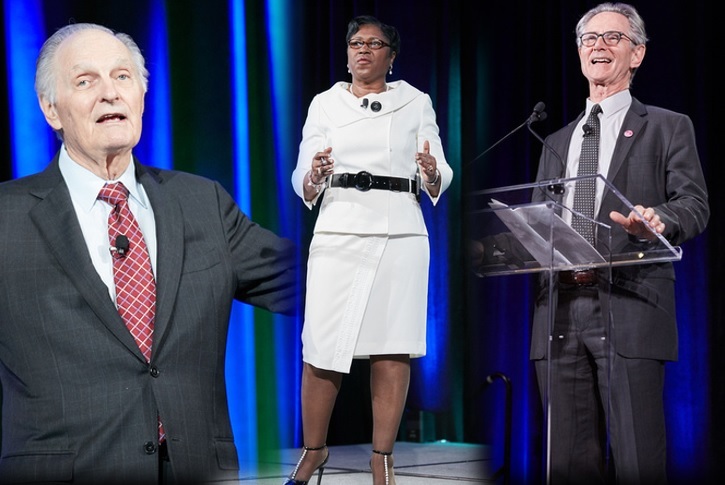 Alan Alda, Freddie White-Johnson, and Joe Selby spoke at the 2017 PCORI Annual Meeting. Nearly 1,000 people attended this year and, as we’ve seen in the past, there was a rich mix of stakeholders. Close to 300 were researchers, but another 200 were patients, caregivers, and health advocates; some 150 more were clinicians and hospital or health-system representatives. The rest came from the industry, payer, employer, and policy communities. It was gratifying to see such a diverse crowd, which was something our attendees recognized as unusual for a meeting convened by a major research funder. We think it’s a testament to how patient-centered outcomes research resonates with the healthcare community. This year’s theme was “Delivering Results, Informing Choices,” and you could see what we meant by that in breakout sessions, where results of more than a dozen PCORI-funded studies were presented. It’s clear that our work is starting to address evidence gaps in critical clinical areas, providing findings that focus on answering the questions that matter most to patients. Then there were our plenary sessions, which I found to be especially compelling this year. I was inspired by the words of Freddie White-Johnson, whose father’s death due to lung cancer was the driving force behind her mission to eliminate disparities in health care and become an advocate for the underserved. Actor, director, and author Alan Alda spoke eloquently and with great humor about the need to improve communication among patients, physicians, and researchers. This is key to ensuring that the evidence we’re working to build is asking the right questions and providing answers that are understandable to those who could benefit from them. Harlan Krumholz, a PCORI Board of Governors member and Yale cardiologist and outcomes researcher, urged us to remember that the core of our work is challenging assumptions about what is accepted as the best course of treatment. He also emphasized the importance of having access to data, especially one’s own healthcare data—for personal decision making and, if desired, for research. And Trent Haywood, Chief Medical Officer of the Blue Cross Blue Shield Association, closed out our keynotes by humorously and elegantly reminding us that there are decisions and choices to be made in health care by patients, their clinicians, and their health plans. We can only make them wisely if we are communicating and understanding each other clearly. He also discussed a vision of a national healthcare enterprise that can make patient-centric decisions. I was also pleased that we heard from former US Representative Phil Gingrey of Georgia, an obstetrician-gynecologist who founded and led the GOP Doctors Caucus. In his special introductory remarks prior to our closing plenary, he told us that while a member of Congress, he had opposed PCORI’s creation out of concern that the studies we would fund would dictate clinical and coverage decisions and deny care to those who needed it. After reviewing the work we’ve done in our seven-year history, he spoke powerfully about how he has come to recognize the value of the work we do and the impact of the patient-centered research we’ve funded. Like most of the attendees, I came away from the meeting with a clear, compelling sense of how PCORI has helped establish and nourish a community of healthcare stakeholders energized to change the way health research is done. I’m also optimistic about our prospects for continuing that work. We have a lot to do in the year ahead, particularly in delivering even more results that can positively impact the delivery of quality patient-centered care. But I’m confident that with the community’s support, we’ll meet that goal. If you were among those who attended the Annual Meeting, thanks for joining us. If you could not attend but tuned in via webcast or followed us on Twitter, we appreciate your joining us virtually. If you couldn’t catch the meeting at all, please visit our website to see speakers’ slides, along with archives of our webcasts. We can’t do what we do without you. So, thank you, as always, for your interest in our work and ongoing support. I hope to see you at next year’s meeting.